In 2011, Friends of Edgewood and the DEC agreed to part ways due to various issues that I won't go into great detail here. We decided to adopt the preserve under the LIGHT (Long Island Greenways and Healthy Trails) group and we will continue to maintain the preserve, lead hikes and bike rides, and do whatever is is necessary to keep the preserve clean, safe, and fun. We signed a multi-year stewardship agreement with the DEC in 2011. We led a hike for a private group and had three bike rides in 2013, the last one covered 12 miles in total. We also helped out with a cleanup or two sponsored by the Edgewood Flyers, who have adopted the parking lot and frontage from Burlington Ave. to Nicols Road. The DEC has done a lot of work at the preserve in 2013-2014 . First, we asked them to clear the roadbed of Old Commack Road, while we kept trimming it, we could not keep up with the growth of poison ivy and other nuisance plants. They used a small bulldozer and got it done right. We have been back to rake it up a few times, so that leaves and pine needles don't compost themselves on the road and allow the weeds to take over again. The DEC also has cleared invasives on about 8 or so acres to the east of the Flyers field. This is experimental and they will be studying what comes back in the spring to determine what other treatments are needed and how we can expand to get the old field system restored. 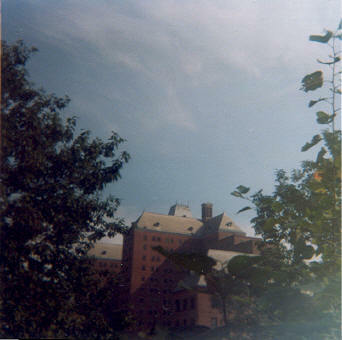 Pines, native grasses and plants, as well as old hospital trees will remain intact. We encourage them to clear the mugwort field just to the north of the cleared area. The DEC has constructed a pavilion in honor of Senator Johnson, just northeast of the main parking area. It was dedicated in April 2014 as part of an Earth Day celebration. Please use it as you like, it provides a shady area with a roof for groups to gather before or after hikes, bike rides, etc. as well as a rain shelter if you arrived by foot or bicycle. Please clean up after yourselves!!! There also is a new area south of the flyer's field that has been fenced in, which hosts several goats in an experiment to try to control invasives. Please leave them alone and certainly don't feed them! That would not help matters for sure. Please control your dogs and keep them on leash when in this area. The DEC and LIGHT are working with Pilgrim to secure the lands adjacent to the preserve from dumping and other illegal uses, as well as with Heartland. Pilgrim has begun to clean up many illegal dumpsites and installed new fences to keep out unwanted vehicles. We hope to work with them on other projects. We had the out of service streetlights near the DP Train Station repaired,but somone already crashed into another pole taking 3 of the lights out again. We'll try again! It's time to finally transfer the rest of the State lands to the Edgewood preserve or to otherwise permanently preserve at least 75% of the land once set aside to build the Long Island Truck-Rail InterModal or "LITRIM". The bills were held up in the Assembly committees again and there was no vote in that chamber. We do not think there will be any new bills this year, 2013. However, a new intermodal located in Yaphank seems to be gearing up for major expansion, and theremay not be much of a need for the one located in densely populated Brentwood anymore. The Yaphank location has several advantages, including existing great access to the LI Expressway, less than 1000 feet away from the terminal, existing highway access, much more land for expansion, and the support of the local civics. Most importantly, there are almost no homes within a half mile or so of the site. Home Depot has just signed on as a major user of this location and the company is buying up at least 220 more acres for expansion. We do have concerns about impacts to the Carman's River at that location so we hope some lands that drain into the watershed are also protected before rapid expansion takes place. We hope the state can just make a decision to protect the former proposed LITRIM Intermodal site as part of the Edgewood Preserve either by executive decision or action by the OGS commissioner. THE SENATE and ASSEMBLY BILLS DID PASS BOTH HOUSES THREE YEARS AGO But were vetoed by then governor Paterson. Lobbying from the Waste transport and railroad industry didn't help for sure. Another study was ordered by the governor, and has been released... it was not a high-quality document. We took the UTRC team out to the preserve and showed them, in great detail, why this place was and is special. Efforts are being made to make sure they still enforce the laws of 1987, which stated that all excess lands of Pilgrim State that could regenerate native vegetation should be transferred to the Edgewood preserve. You may have noticed that many native species have indeed returned to at least half of the tract, and the rest would also if left to natural events. Also, the stormwater retention pond is now home to thousands of frogs and other species. Meetings with various officials and NYDOT continue into 2011 to discuss the intermodal and the problems it would cause if built at the currently planned site. We led an onsite tour and also met with Newsday and other groups. Although the veto of the bill was a bit of a setback, there is again much hope today. On September 1, 2009 I resigned as president and founder of the Friends of the Edgewood-Oak Brush Plains preserve and will no longer be serving on the board of directors of this group. I will concentrate instead on my position of committee chair at LIGHT (LI Greenways and Healthy Trails) and as a member of the Stewards of Edgewood, a group consisting of LIGHT, The Edgewood Flyers, And CLIMB. I have continued to work with the DEC and signed a stewardship agreement to work on ongoing needs such as occasional cleanups, trail enhancement operations, perimeter security of the site and occasional bike rides and hikes. The former Friends of Edgewood have dissolved their agreement with DEC and it is not known if they still formally exist. LIGHT will concentrate on regional trails, connectivity, cycling and walking as well as the existing Edgewood trails, replacing the demolished bridge over Commack road, keeping out illegal dumpers, 4 wheelers and ATV's and will work directly with DEC as needed. LIGHT projects include the abandoned Motor Parkway corridor trail, the Ocean Parkway trail, the Robert Moses Causeway trail, Sagtikos Parkway trail, Port Jefferson to Wading River, extended Bethpage Bikeway and a rebuilt Wantagh parkway trail. We'd like to see trail or bike lanes on Commack road when it is rebuilt, and connectivity with the new bridge. A bike trail or lane could cross the road at the bridge location and get users to the north end of Old Commack road, as well as the Pilgrim entrance which would also get them to Heartland. Stewards or Edgewood had a cleanup event in March and in May 2013. Working with the Flyers, we cleaned up the area along Commack road, LIGHT Trimmed and raked up the southern half mile of old Commack road, and CLIMB trimmed the bike trails. LIGHT also trimmed the entire hiking trail in June 2013 and did some touching up along the bike trails, an ongoing process. There was a successful meeting of the Edgewood Task force in the Spring of 2013. The Stewards of Edgewood were present, as were key DEC officials, Pilgrim Hospital officials, Local, county and state legislative officials, and chiefs of the DPFD. There is a new spirit of cooperation among the members of the group who met, and much will be accomplished in the near future. Thank you to all who attended, we look forward to working with everyone in the future to make this place even more special. There were a few low key hikes in 2011 and 2012. We walked way beyond the preserve in some cases, covering the already protected "Parkway woods" both east and west side, the LITRIM site, and some way off the beaten path places even I had never set foot on before. I saw that some buildings at Pilgrim were about to be demolished and got permission to document them inside and out before they went down... sort of like an indoor solo hike. We did have a winter hike in January 2010... it was about 20 degrees that morning and only one new hiker showed up but we'll consider that a success!! !We did cover about 6 miles. Another Mountain Bike ride was held under a steady downpour on August 29th also at 9AM. I was about to give up but two diehard riders showed up and were not afraid to get wet, so I led the way! We covered all the marked Mountain biking trails and got drenched and muddy too! A Mountain Bike ride was held on June 27th 2009 at 9AM. 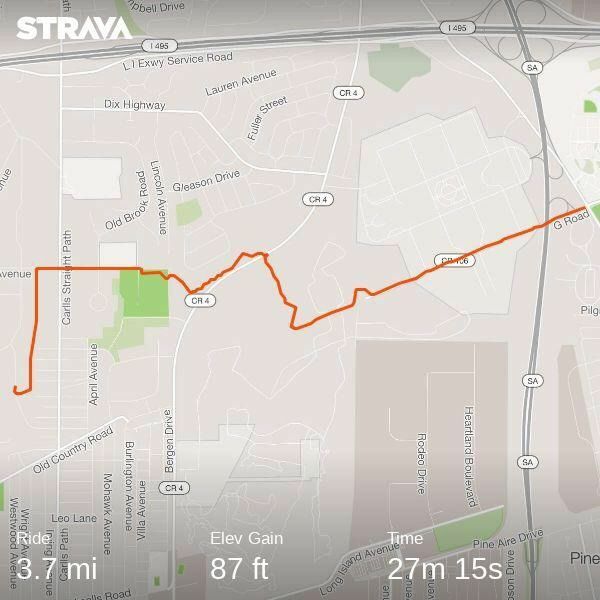 We rode for about 2 hours and covered all the marked MTB trails and made a few side trips to rarely seen corners of the preserve. We hiked on August 15, 2009 at 9 AM, covering 5 to 6 miles and the weather was great! An off-site mountain bike ride on the proposed GREENLEAF trail was held on July 26, 2009 and while it was hot and I wrecked my derailluer gears near the end, it was a blast. The June 6th Planting event was CANCELED and will not be rescheduled. The annual earth day cleanup and maintenance event was held on Saturday April 25, at 10 AM. We had a great turnout, trails were trimmed, the parking lot got a face-lift and the final debris was removed. First SPRING 2009 HIKE was on Sunday, May 31 at 10AM. We were out for about 2 hours and covered about 4 to 5 miles. It was the final hike over to the old bridge which was sadly demolished in JULY 2009. On Earth Day weekend in April 2009 we held another clean up and trail work event at the preserve. Tons of junk, including a few old oil drums and tires were hauled out, trails were trimmed, and the parking lot was groomed. Very little debris remains now, and it will be removed long before the next earth day event. I led 2 hikes and 2 mountain bike rides over the summer, the last one was a big rain out but 2 local youths showed up and got the tour... we all got drenched and muddy on that late August ride but so what... that was also true on the 2009 Bike NY event I rode. What a rainy summer we had! Also fixed a few broken gates and replaced a missing manhole cover or two over the summer. Just started trimming the trails again, did the whole hiking trail in July but looks like sections that have autumn olive and multi-floral roses will need another touch up. On November 1st, 2008 A major cleanup and trail maintenence program was held, there was a large turnout and much was accomplished. All the major trails were cleared and conditioned, various litter around the parking lot was removed, and weeds were also trimmed and pulled. A couple of remaining heavy items were removed and the bulk of the entire site is now spotless! On July 26, 2008 I led a longer mountain bike ride, following the main loop, back to the bridge and over to Otsego, then all the trails in the LITRIM site and way back to the Pilgrim Rail Line. We had a nice group...thanks to CLIMB. Later on we went back and met up with another group doing some plant identifying. We cut some branches out of the way and discussed future trails. On May 10th a 5 mile hike took place, and the rest of us then caught up with the crew installing bat houses as part of the Eagle Scout project. Thanks to the Deer Park Fire Dept. and the Boy scouts... Eagle Scout project to install birdhouses and bat houses has been completed. The DPFD were kind enough to use their ladder trucks during a sunny Saturday in May to install the bat houses on top of telephone poles. The Earth Day event held on April 26, 2008 cleanup was another success, great weather and a huge turnout. Dignitaries included Assemblyman Bob Sweeney, Babylon Supervisor Steve Bellone, and Legislator Steve Stern. Thanks again to the boy scouts and girl scouts, and all the other volunteers who were there. We could not do it without you! Thanks also to the DEC for picking up the debris piles we created at the old rail spur, and thank to the Town of Huntington for removal of the Euclid area powerline debris piles. Thanks to Babylon Town too for the LI Ave debris pile removals, fixing the streetlights and all the other assistance with the events. A cleanup and trailwork event was held on October 20th and all of the hiking trails were trimmed. Litter and debris were bagged, and people we noticing how much better the preserve looks! Also, together with CLIMB, we marked and connected some missing links in the mountain bike loop. All those trails also were trimmed back. A half-mile section of LI Ave. was adopted along the north side of the road which is the preserve border in cooperation with the Town of Babylon. It was last cleaned in May of 2008. Further work there is on hiatus until the shoulder can be cut back and a new fence installed. Some of the flowers were stolen and others were driven over by cars. We do expect a few to bloom in the spring though. THE SECOND DOT PUBLIC HEARING WAS HELD ON THE 20th of SEPTEMBER in the Van Nostrand Theater at the Suffolk Community College Brentwood Campus. EVEN MORE PEOPLE CAME OUT AND SPOKE OUT AGAINST THE PROJECT THIS TIME! THE MOVEMENT IS GROWING! GET ON BOARD AND KILL THIS MONSTOSITY! LET'S DO IT! ANOTHER "WERE NOT GONNA TAKE IT" ANTI-TRIM RALLY WAS HELD ON SEPTEMBER 10th 5:30PM AT G ROAD WHERE IT MEETS CROOKED HILL ROAD... IT WAS A HUGE SUCCESS and showed that all the communities including Brentwood, Dix Hills and Deer Park can and will work together to defeat this ill-advised project. Over 700 people showed up for Rally number 2 on August 16th. which was held at the intersection of Pine Hill Lane and Commack Road in Dix Hills, as was rally number one on July 13th... The first public hearing was held on June 19, 2007 at the Brentwood North Middle School from 4 PM to 9 PM. With one exception, everyone who spoke was against the project. Most of the DOT staff left the room during the public comment period. The Draft environmental impact statement for the TRIM Intermodal is OUT with little fanfare and right in the middle of vacation time! EVERYONE WHO CARES ABOUT THE AIR QUALITY, NOISE, AND TRAFFIC as well as impacts on RECREATIONAL ASSETS, WILDLIFE, GROUNDWATER and PROPERTY VALUES MUST get their comments in no later than September 24, 2007!!! This deadline was extended and is FINAL... anything received later by DOT will be ignored but letters to the governor should KEEP GOING OUT! More great news... NY State Senators Johnson, Flanagan, and Trunzo have written a strong letter to the DOT commissioner asking her to cancel this project. Furthermore, they have introduced legislation to transfer the entire TRIM site to the DEC as a major addition to the Edgewood preserve. NYS Assemblyman Philip Ramos, and Assemblyman Andy Raia, along with the above senators, Babylon Town supervisor Steve Bellone and Huntington Supervisor Frank Petrone, and County Legislators Steve Stern and Montano asked for an extension to the public comment period, which was granted. Legislator Louis D'Amaro wrote a strong letter to the governor and many other officials calling for the cancellation of the DOT TRIM project on this site. The project is clearly in trouble, but it is still not dead. Until DOT or the governor declares it to be over, we must FIGHT to stop it. You would think the 600 person turnout at the last rally would have convinced them that we are not going to "get on board or get out of the way!" as one unnamed official once told us. For more information go to this site: www.nysdot.gov/portal/page/portal/regional-offices/region10/projects/long-island-intermodal and click on the "draft environmental impact statement" link. The site will explain what is planned and how this site will handle most of LI's rail freight by transferring it to 18 wheel tractor trailers and distributing it using our local roads such as Crooked Hill Road. Wouldn't a shorter direct link be nice? They had one and changed it to this difficult to find site instead. Get in touch with your local legislators, state senators and assemblymen, the county executive, and the GOVERNOR to let them know how you feel! WELCOME to the Edgewood site! A group known as "Friends of the Edgewood Preserve" under the "Adopt a Natural Resource" program of the NY DEC was created. I was the first president and founder of the non-profit Friends of Edgewood organization. I'm no longer affiliated with this group but support their ongoing efforts. Thanks to NYS Senator Owen Johnson $350,000 in funding for was secured for improvements to the Edgewood preserve. And thanks to Assemblyman Robert Sweeney funding was obtained to build a visitor center at the preserve. Among the Friends of Edgewood goals is to improve and maintain the existing preserve, prevent dumping and to preserve the maximum amount of open space and connecting infrastructures around the area. A long term goal is in one word "connectivity" : to create a user-friendly network of walkways, trails, and paved bikepaths to connect our parks, beaches, preserves, communities, retail centers and other open spaces. An "Edgewood Task Force" in which all three towns, the state, and the county as well as neighbors such a Heartland and Pilgrim are represented was formed to address the sometimes complex goals and management issues at the site. 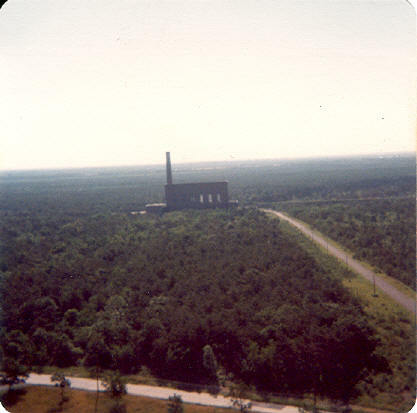 The first trail leading off-site would head west into Nassau and is being studied by officials. It is part of the LIGHT (Long Island Greenways and Healthy Trails) plan. A comprehensive history of the Edgewood Oak Brush Plains preserve property is also detailed below. There are some new threats to the integrity of the preserve. These threats are the LI TRIM Intermodal train-truck transfer facility, possibly coupled with a full sized truck stop, access roads, a triple set of train tracks through NY parkland, and a possible truck road for the Tanger mall. A big multi-faceted Earth day event took place on April 21, 2007 at 1PM to 4 PM. To get things rolling I went over there at 8 AM myself and began hauling out the usual refrigerators, stoves, and car parts, filling up the van a few times and bringing out the debris. Then, around 1 PM we cleaned up the parking lot, trimmed trails, and planted 50 oak tree seedlings, and some ground cover. So many people came out to join us, and the parking lot was more than full! A special thanks to the Town of Huntington who came in and removed the massive debris piles we assembled near the Euclid Ave. powerlines! It has never looked so good. On April 28 I led a hike to the site of the proposed TRIM Intermodal Rail- Truck transfer facility. Some concerned civic groups and Legislator Stern walked to the border of the preserve and walked through major portions of both properties and explained why the TRIM would have an overall negative impact on the region. On June 2nd the first and only "Welcome Back to the Preserve" event was held and a major effort to prepare the site was made. Many days were spent on various activities, organizing, and planning, as well as physically cleaning out the locations for the participants. The event was great... we led several well attended hikes and bike rides, and participants held demonstrations on wildlife, nature, model airplanes, injured animal rehabilitation, bird watching, mountain biking, the cosmos, and nature photography. A big thanks to all the participants, and the towns of Babylon and Huntington. We also are very happy to announce that "TEP" funding to renovate the long-abandoned bridge over Commack Road has been approved. It has taken 6 years to reach this point, and we would like to thank Legislator Steven Stern, Senator Owen Johnson, Gordon Canary, and their staff for their dedication and help on this project. But we still face possible demolition since the DPW is opposed to renovating the bridge, citing threats to trucks and cars from this bridge...they are not too worried about pedestrians and bicyclists I suppose. Another battle to take on! Saturday February 10th at 9:30 AM I led a "Get Healthy Hike", a fairly brisk walk along the paved Old Commack Road trail and some woodland trails. On Saturday, March 24th, at 9:30AM another longer, more traditional hike along the trails took place. It was nice to meet many new faces at both events. Our monthly birdwalks also continue... third Sunday of each month at 9AM. All events require meeting in the parking lot about 5 minutes before the listed time. On November 4, 2006 the first trail maintenance event took place, we met at the parking lot and trimmed both trailheads north and south of the parking lot, and good parts of the main trail itself. Some of us hauled out some more huge piles of scrap metal from the woods near Euclid Ave and will complete this operation in early 2007. On October 29th we had a long mountain bike ride at Edgewood... covered just about all the trails and possible trails! It was muddy but that goes with the turf... the trails do need some work! Sadly, with all the good news there are always a few setbacks. Not only have ATV riders gone around someof the walls but they continue to harass some legitimate users of the preserve. And someone using some sort of heavy equipment lifted 2 concrete wall sections out of place, which was quickly followed by an act of vandalism and arson of a stolen SUV near the former site of the old Edgewood powerhouse. The wall was repaired by DEC, removed again a few weeks later at G road. It was quickly repaired by DEC and reinforced before any more illegal dumping took place. The DEC had 2 ATV sting operations, at least 10 ATV's and dirt bikes were impounded in total and may summonses were issued. Some were written at night and the riders were drinking alcohol. We DO need more eyes and ears to observe and report illegal dumping, trespassing and ATV use. Some of these older ATV's are loud and smoky machines which ruin the overall atmosphere at the preserve. If you have ideas for the preserve, we would like to hear them. The September 30, 2006 hike was a lot of fun. It started in Otsego park and headed across the old bridge, then followed some of the trails through the former Multi-Town site. We had a pizza party for Wes who has retired from the DEC at Otsego afterwards. We'll miss you Wes! We also are working on a mountain bike ride scheduled for the 29th of October, 2006, we will meet at the preserve lot located on Commack road at 9 AM. Check here for updates! I did "sort of" hold the June 24th Cleanup but there was really no reason to expect a good turnout. The weather simply did not cooperate and we were even hit with a thunderstorm. However, a short break in the rain allowed a few of us to pick up a truckload of junk along Old Commack road. A special thanks to the DEC and the few hardy folks that showed up anyway. Also, on Sunday, June 11th 2006 at 8 AM we had our first birdwatcher's walk... and saw many birds, but most notably, 2 bald eagles flying about 8000 feet up, circling! Another cleanup was held at Edgewood on April 21st and 22nd 2006. Although it rained heavily, at least 12 die hard souls turned out and helped haul out everything from bottle and cans to refrigerators, boilers, and engine blocks. Breakfast was served thanks to Heartland Business centers on that rainy Saturday morning. 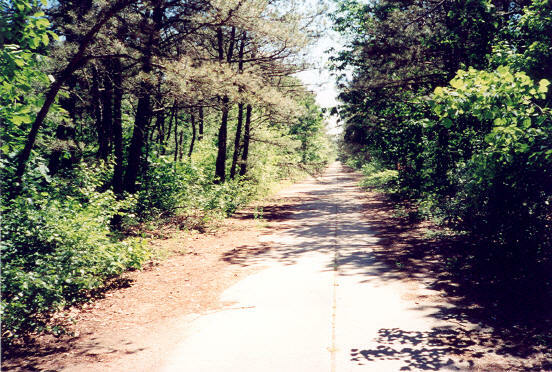 On April 21 2006, the Town of Babylon, Town of Huntington, and county of Suffolk joined the NYDEC and hauled out major debris and completed the task of repairing the potholes on the Old Commack road recreational path. The road is now free of all major potholes for the first time in decades. Also, the county inspected the old bridge over Commack and determined it to be structurally sound, a major bit of good news! But because of the inclement weather we MUST do it again in the fall of 2006! And now a special Thanks to the following people, and I know I will forget and leave someone off the list and for this I apologize: Owen Johnson, Gordon Canary, Steve Bellone, Vanessa Baird-Streeter, Frank Petrone, Peter Scully, Lou D'Amaro, John Flanagan, Steven Stern, Robert Sweeney, Deborah Williams, Chuck Hamilton, Bill Fonda, Henry Doll, Mark Cuthbertson, Susan Berland, Margo Myles, Josephine Jahier, Robert Caroppoli, Jerry Wolkoff, Wes Gehres, Mike Giocondo, Mike Vitti, CLIMB, LIGHT and certainly the army of hard working volunteers we have had in the past 3 years to help with all the preserve cleanup and trail efforts. A special thanks to Deborah Morris of Newsday for getting our story on page 10 of the Saturday April 22 edition. If we left anyone out, please let us know! Sadly a massive brush fire ripped through about 100 acres of the preserve's southern sections. It jumped LI avenue and began heading to the Deer Park train station, briefly jumping the LIRR tracks onto the south side. Luckily the 43 fire depts were able to get it under control before anyone was hurt or property was lost. The forest is already beginning to recover, but evidence of the damage will be apparent for years. Another BIG cleanup took place on November 16, 2005. We had a total of 50 participants show up, and we completely cleaned up the area surrounding the old radio/weather tower Several tons of metal and other debris were hauled out to Old Commack road, where a 50 yard dumpster was almost filled to the top, and this was WITHOUT the metal or tires which were piled up separately for recycling! MUCH THANKS to all of the people who came out from the hiking(LI Greenbelt), bicycle,(CLIMB and PedalPushers Online) and geocaching groups(LIGO) as well as the local residents and students who joined. A special thanks to Senator Johnson and his great staff for taking the time to come and view our efforts and for all of his support and of course for making the preserve a reality. Also, thanks to Wes and Mike of the NYDEC for making the arrangements and the great DEC operations team who got the stuff hauled out real fast! The July 16th cleanup successfully removed more than a ton of old appliances, tires, car parts, a drum containing unknown wastes and much litter. We hope you read the story in Newsday on Monday OCTOBER 24, 2005 regarding the regional trail proposal. Please support this goal any way you can!!! It's slowly getting cleaner over at the preserve, we observed the return of frogs and thousands of tadpoles We could not have done it without ALL of you! Now get ready for the next big event! The parking lot is now PAVED thanks to the grants from Senator Johnson and Assemblyman Sweeney. We finally have a refurbished wooden sign thanks to the Edgewood Flyers. Say thanks to the wonderful DEC in-house operations team for the renovation. The new guard rails are in and the lot is much more secure. Please don't litter or dump on preserve property under any circumstances. We have made a major effort here and would like to see the land respected. More trees and vegetation will be planted and the old lot will still be available for special events. Also, new concrete barriers to prevent illegal entry and dumping have been installed and steel gates at key points are in progress. A 6.2 mile HIKE was held on Saturday, JUNE 18, 2005 at the preserve. Everyone who came out had a good time and got to see some parts of the property not covered in previous hikes. Another 5.0 mile hike took place on February 11, 2006 and was a lot of fun, although it was a little brisk we still had a good turnout. Suffolk County Legislator Steven Stern joined us, and we had 3 other new participants who will join our future efforts. For all future cleanups check in with us or get on our e-mail list... As always we'll meet in the parking lot on the east side of Commack road, about 1.5 miles south of the LIE. If you are interested in helping out with the preserve in any way and or learning about our efforts, please join us for a little while. Another hike WILL be planned shortly afterwards. About 843 acres have been safely preserved, mainly due to the tireless efforts of NY State Senator Owen Johnson. Mr. Johnson has now funded an additional $350,000 to NYDEC specifically for improvements at Edgewood. We have formed a task force consisting of all local interested parties, including the surrounding 3 towns, the county, and NY state, to decide on future uses and enhancements to the preserve. We would like to thank Senator Johnson for obtaining this funding and his continued work to make sure the preserve is protected. Not many people recognized the rare ecological uniqueness of the Oak Brush vegetation and there were many proposals to fully develop the property. Senator Johnson originally created an ad-hoc committee back in the early 1980's to study how it could be protected, worked closely with the NYSDEC, then introduced the legislation that created the Preserve in 1987. Subsequently, the senator made sure the 100 acres of the defunct Multi-Town property was purchased and added to the Preserve and then encouraged Governor Pataki to transfer the last 86 acre parcel adjacent to the Pilgrim State property as well. I would like to thank Senator Johnson for having the vision for creating, protecting, and funding this unique preserve! The forest consists mainly of pitch pine, scrub oak, scarlet oak, and white oak but there are many other species present. There are also area hosting visiting red tail hawks, various owls, rabbits, fox, raccoons, chipmunks, squirrels, turtles, frogs, snakes, rare moths, dragonflies, and many other species. An area where the buildings once stood is now full of invasive autumn olive and multi-flora rose. It hopefully can be restored to open field areas in the future, leaving the pitch pines that have returned intact. There are several new proposals for the surrounding area. A new regional TANGER shopping mecca has opened on Commack road at the former AIL-EDO plant. This will certainly add traffic to local roads and diesel emmissions to the already questionable air quality in the area. There is a bad proposal to build an intermodal TRIM facility, which would introduce freight trains and trucks to a 100 acre site directly adjacent to the preserve. We asked for and received some items, including a greenbelt to connect to the 132 acre parkway woods and a ban on any new roads THROUGH the Edgewood Preserve. But we still worry about the negative impacts that idling trucks and trains, as well as an expected increase in truck traffic on local roads, will have on the preserve and on the people who would live in the new "mini-city" proposed for the Pilgrim site. That proposal at Pilgrim could add up to 9,000 apartments, a 15 story office building, and a new aquarium, among other commercial and retail buildings, on the the surplus lands of Pilgrim State Hospital. There are several parcels adjacent to the preserve such as the 132 acre NY State Parkways parcel adjacent to the Sagtikos Parkway, and hopefully ALL of the intermodal site, as well as some wooded lands on the periphery of the other project sites that could possibly be used as preserve additions or recreation. Current plans call for saving 17 acres out of the 87 at Heartland industrial park, and saving about 35 wooded acres at the main Pilgrim site, meaning over 400 at Pilgrim may be developed. 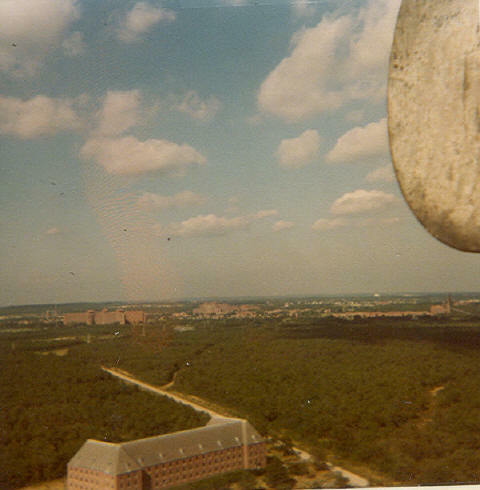 The adjoining photo shows the Edgewood land in 1975. 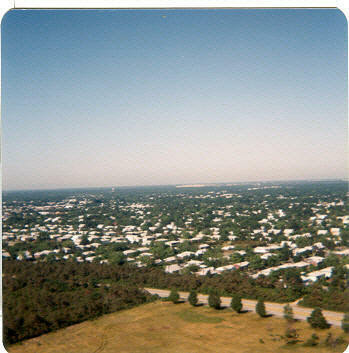 All the land in the foreground is preserved, but the land to the east has been developed as the Heartland industrial park. It is hoped that more native landscaping and low-impact outdoor lighting can be utilized in these developments. Islip town had proposed an incinerator on part of the Heartland property, when that LUCKILY failed, the town wanted to get it back on the tax rolls. 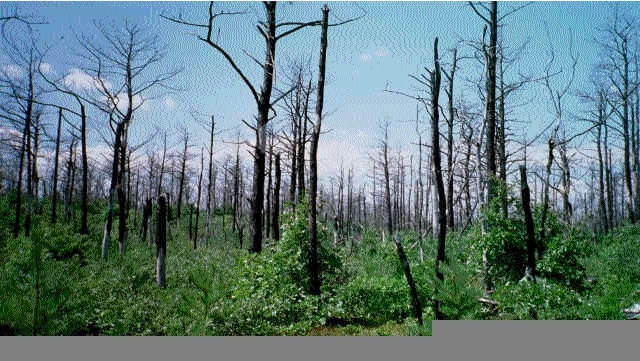 About 1/3rd of the land was previously used to burn debris from the 1985 Hurricane Gloria, and was full of invasives and debris. Overall there should not be any major effects on the existing preserve, and we are working with the developer on the future projects to make the area as bike and pedestrian friendly as possible, as well as get rid of illegal ATVs and waste dumpers. We also seek to clean up the LIPA powerline road, secure it, and discuss future management of the 17 acre buffer zone just east of the preserve. Another trail could be developed along the LIPA road to improve pedestrian access to the LIRR station. Some more land needs to be set aside as open space, many of these parcels can be linked together as part of a regional park and trails system. Suffolk County is planning to improve Commack Road south of the Long Island Expressway in 2010. It will be cost effective to build adjacent bike and pedestrian trails or lanes and also replace the old pedestrian bridge at that time, rather than just widen it and create a more dangerous road that will only attract more traffic again. Planning these projects together and having a master plan for preservation and recreation is essential. Another idea is building the LIGHT project trail, which is a big project to build the first east-west biking, hiking, and walking trail. It would start at the Edgewood Preserve adjacent to Heartland and head west through many parks including Bethpage State Park and Eisenhower Park and even allow users to get to Jones Beach! Also, a bike lane or multi-use trail could be added at the same time on the west side of Commack Road, starting at the LIE service road in Dix Hills and running south to Long Island Avenue in Deer Park, then heading east to the LIRR station. It could intersect with the replacement bridge about one mile south of the LIE, which could easily be constructed at the same time as the rest of the project, and enhance the area by providing a safe alternative for bicyclists, walkers, and runners to use the facilities at the Edgewood preserve without using a car to get there. A short lane could head up to the Pilgrim entrance and the adjacent Old Commack Road bike path on the east side as well. This would improve it's rideability and walkability, since it is currently listed as a bike route. Also, the proposed bike lanes might encourage people to ride bicycles to the overcrowded LIRR station instead of taking cars. Old Commack road has already been patched up and is designated by NYDEC as a bike trail. We also propose having a shore to shore recreational trail along the Sunken Meadow Parkway,Sagtikos Parkway,and Robert Moses Causeway, and for those trails to be linked to the others through the proposed Heartland developments. We researched routes heading west that could hook up to the proposed "Vanderbilt" LI Motor Parkway trail and eastward along other usable areas such as the LIPA routes. The developers want to createas much pedestrian and bike access as possible and we certainly want to help with that. They will encourage paths to cross their lands, hopefully reducing auto traffic and congestion. This would enable anyone to ride from Deer Park, Dix Hills, and the adjacent areas including Heartland up to the north and south shore where the 13 mile Ocean parkway bikepath construction will hopefully begin in 2011. If enough people write and speak to their county and state officials, and otherwise support the ideas, we could make this all happen! The old bridge had great potential for re-use as a safe crossing point on Commack Road (CR4). This structure has been abandoned for over 50 years and now it is GONE. It connected a series of trails that allow people to hike or mountain bike through at least 6 miles of interconnected trails and more that are being planned. Replacement of this bridge is planned but we need to stay involved or it may not happen! It is the only safe way to reach the proposed LI Motor Parkway trail and almost require a car to access the Edgewood preserve, since it is difficult to cross the heavily traveled Commack road during normal hours. Another pedestrian was killed just north of Nicoll's road in June 2011 and it is time to add sidewalks, bike lanes or a bike path, and a new bridge to prevent future fatalities and injuries on this road. More unused land consists of about 105 acres of former Pilgrim lands that once had been used for a sewage treatment system. 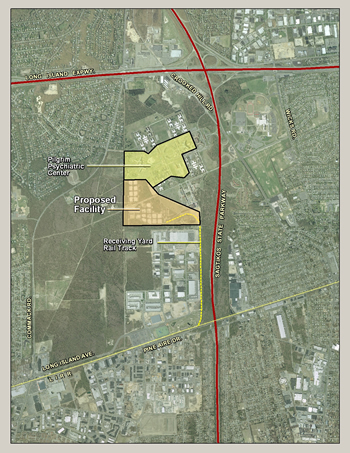 A rail freight intermodal operation is planned for this land, but it is too close to the preserve and to existing and proposed residential areas. The forest has begun to regrow in much of the area, and at least 40 acres or so were never disturbed in the first place are very valuable. 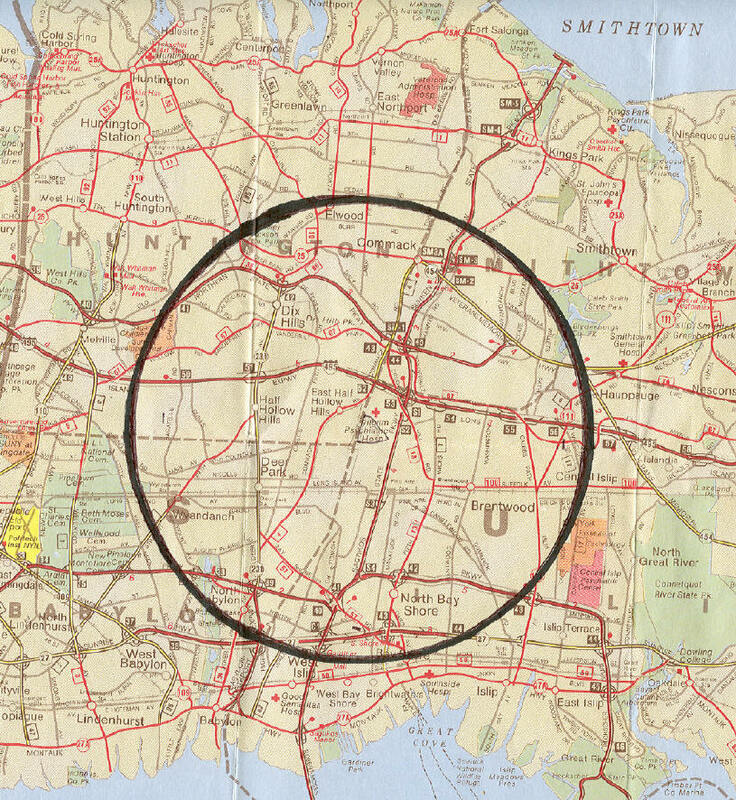 Several smaller intermodals could be constructed on LI, perhaps one in Nassau, two in Suffolk, and one in Queens. Also, private companies have several intermodal projects in various stages of development. The taxpayer should not have to pay for it! One WAS being planned in Maspeth, as part of the Cross Harbor Rail Tunnel, which would help, but that was successfully fought by local residents and Mayor Bloomberg. Some of Western LI may benefit from the intermodal, but at the expense of the Deer Park/Dix Hills/Brentwood area, which would see an increase in truck traffic and related pollution from both truck and train diesel exhausts, as well as noise. I have asked for creation of special rules regarding truck and train idling restrictions, noise barriers, and daily ticketing of all vehicles not in compliance with emmissions standards. All these ideas were rejected by DOT as impractical, therefore it was determined we have to fight to stop it altogether rather than allow such a facility, which would be operated by a private company or Railroad. There is reason to believe that the facility would eventually be used to ship out municipal waste and/or C&D waste. Many other projects are planned for the former Pilgrim Psychiatric center, and more wooded land could possibly be preserved in exchange for a little higher density on the previously developed land. We support addition of bike lanes and sidewalks to enhance walking and cycling. The Heartland developer supports closing the Pilgrim entrance to all trucks. It would only be used for the remaining Pilgrim hospital operations. The new LI aquarium is also being planned on part of the former Pilgrim site. It would be nice if local residents had a safe bike and pedestrian access route to this new recreational attraction, instead of being forced into their vehicles for the short ride to this complex. Reuse of this bridge will mean there is a safe place for our children, as well as adults, to cross the dangerous Commack road below. A list of legislative E-mail contacts has been added to the bottom of the web page. Please write or e-mail these officials to show your support! It would be advisable to preserve of all the remaining NYS owned property around Pilgrim, the property leased to the FAA, and some private preserve lands just north of the old bridge on the west side of Commack, the parkway lands off the Sagtikos, and possibly some more of the wooded lands that are mostly undisturbed on the borders of the proposed Heartland project. And the Intermodal site must be added to the preserve rather than misused as a freight transfer station. Previously developed land is available for the proposed projects, in fact, demolition of some of the unused buildings at Pilgrim has commenced. Some preservation of a wooded parcel located north of the LI expressway, on the east side of Crooked Hill road in the town of Smithtown would have been nice.. This 50+ acre parcel is located north of the new Target and Expo stores. Unfortunately it has been fully developed... Previously in near pristine condition, it has now been bulldozed and a Wal-Mart, Home Depot and Kohl's are open. There is a lot of controversy now, but it is too late. Use or reuse of facilities such as abandoned roads and railroad rights of way, old bridges, utility routes, abandoned buildings (such as the many located at Kings Park and Camp Hero), parks, undeveloped lands, abandoned parcels set aside for unbuilt roads, etc need to be considered. 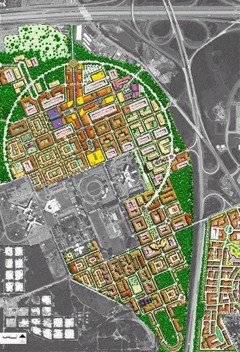 Future developments can be required to set aside greenspaces to eventually be linked together. Historic or Architecturally significant buildings and landmarks should be preserved and adapted to new uses. Transportation and recreational facilities should be fun to use, safe, encourage participation of more people of all ages, and be a useful alternative to competing with automobile traffic on existing roads. Please feel free to contact me with any questions at denisbyrne@yahoo.com or write to your county legislator about it if possible, before our tax dollars are used to unnecessarily destroy a valuable community asset. LI needs to create a network of recreational trails for bicycles, walkers, joggers, rollerbladers, and any other non-motorized transportation modes you can think of. Please consider supporting these goals so LI'ers can avoid getting in the car just to travel a mile to the local park or strip mall. 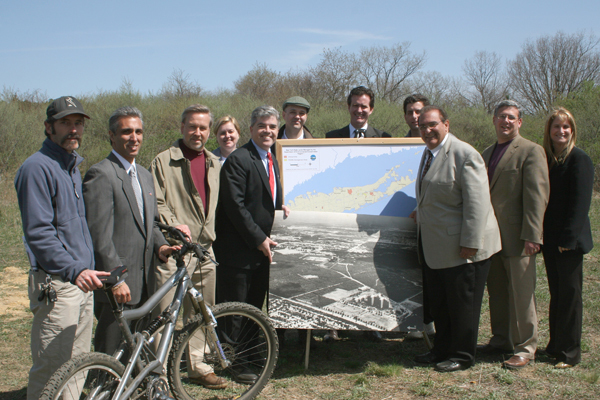 These projects include creating such trails from Belmont Lake to Babylon Village, a 13 mile trail along Ocean Parkway from Jones Beach to Captree and eventually Robert Moses Beach, another connecting Otsego to Edgewood Preserve via the old bridge on Commack and over to the Sunken Meadow parkway greenbelt up to the beach, an extension of the Bethpage parkway bike path to the Cold SPring Harbor LIRR station, another 13 mile route along the abandoned LIRR Wading River branch, and restoring the remaining abandoned sections of the LI Motor parkway, (AKA Vanderbilt parkway) as a recreational path running from Western Suffolk to Queens, where the bike path already exists. It's hard to get people motivated to support these projects, and some people mistakenly believe an increase in crime will come with the "outsiders" coming through. However, in other areas where such trails have been built, home values INCREASED and crime decreased, it actually improved the quality of life in the area and created a park like atmosphere in these areas where it was safe for local children to play away from motor vehicles. The developer of Heartland supports the goals of creating a recreational trail network throughout his development and LI. LI needs more places where people can get OUT of their cars and enjoy some safe human powered recreation... remember how much FUN it was to bike and walk all over town when you were a kid? I think more people would do it if they did not have to deal with traffic clogged roads, diesel fumes, inconsiderate motorists and dangerous conditions. The "Ribbon Park" open space concept is one whose time has come. Please support these plans by sending in your contact info... and ideas, and speaking in favor of them whenever possible. Anyone interested in supporting any of the bikepath projects should visit the The LI Motorparkway site , The Rail-Trail site, and Replace the Bridgefor more info and let the DOT and local leaders know of your support! ARE YOU IN THE TRIM ZONE?? ?